Well after getting a later start due to having breakfast with my lovely wife, my mother and my grandfather; we went back to work on the signage. 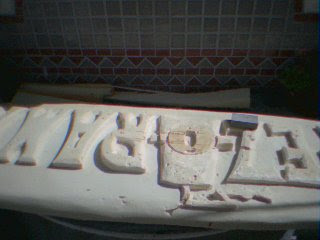 Here you can see some more shaping done with a knife and Dremel then later, sanding blocks. 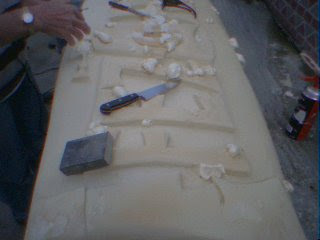 After that we attempted to fill in gaps with expanding foam. It worked fairly well but not perfectly. I'm sure there is a learning curve here but we have no time for that. 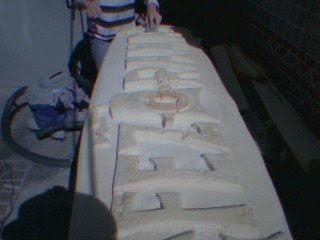 Tomorrow I will fill in the massive gap on the backside with foam and next week we will hopefully have this in paint.